"You think you know me. You don't know me!" Even before the September 11th tragedy, people the likes of Pat Buchanan had espoused closing down America's borders, shuttering new immigrants. While I understand the fear of allowing potential terrorists into our country, we should never forget that we are ALL immigrants here, and more so, it was our migrated ancestors who made this country the democratic society it is today. With each passing year more and more immigrants passed through Ellis or Angel Island, each with their own voyage of pain and loss; their eventual landing upon the shores of Hope Regained, set to the music of the American Dream: each An American Rhapsody. Forced to flee Hungary's oppressive Soviet satellite government, Margit (Kinski) and Peter (Goldwyn) manage to obtain US visas, but are unable to take the youngest of their two daughters, Szuszi (Suzanne), a mere baby, with them. Leaving behind a trail of their worldly possessions—the need to lighten the load overtakes the value of the objects—the three walk miles across the cold terrain of the country, then are smuggled out via train and a daring crossing at the patrolled, barb-wired border. By the time they settle in Vienna, they learn that Margit's mother, in whose care they left Suzanne, has been imprisoned, and their daughter sent to live with a couple in the country. While torturous to her, Peter pleads with a despondent Margit to press on to America, to believe Suzanne will be brought over when the right opportunity presents itself.For Suzanne, this is a time of wonder and joy with her guardians, Teri and Jeno, unaware they are not her real parents. Years pass, and Margit's mother, just released from prison, arranges for Suzanne's passage to America (Los Angeles) and her eagerly awaiting family. But life in America is not in itself better when one has been wrenched from one's "known" family, to live with "strangers" in a foreign land, with a foreign language. As little Szuszi grows up into Suzanne, the distance between her and her "American" mother becomes an almost insurmountable crevasse, and the escalating violence between the two threatens to rip the family apart... or worse. An American Rhapsody is a successful labor of love, based on the writer-director's (Éva Gárdoz) own life, and is a heartfelt story about love and loss, and the true meaning of "family." I don't scare or tear up easily, but this film touched me in a way that no film has in an awfully long time. The performances up and down the line here are excellent. Kinski's performance as the tortured mother fighting to regain the love of a daughter is powerful, and easily her best to date. Tony Goldwyn, normally the villain (i.e., Ghost), imbues his character with the believable strength of his convictions and the patience, kindness and understanding his lost daughter seeks. However, it is the two actresses that play Szuszi that steal the show. The young, adorably gap-toothed actress (Kelly Endresz-Banlaki) who plays Szuszi as a child is unbelievably "emotionally available" (as the director says on the commentary track), and easily allows the audience to identify with her awe and joy, pain and suffering. Scarlett Johansson's (Ghost World) performance as the teenage Suzanne deftly swings the pendulum from adapted, but angst-ridden American teenager to the luminous little Hungarian girl stolen from her "family" and lost in a suitcase of memories. Image Transfer Review: The 1.85:1 anamorphic transfer is of differing quality, not only between the black & white and color portions, but within the latter as well. There is a fair amount of fine grain in the black & white Hungarian scenes, but it only serves to heighten the 1960s, Cold War-look the director was aiming for, despite outstanding black level and shadow delineation (!). However, besides a fair amount of fine grain, the color portions contain some digital artifacting and scanlines as well. Contrast and color saturation are middling in some of the early outdoor color sequences, but fare better in indoor and night sequences. There is occasional speckling and dirt, but the source print, in genera,l appears clean. The transfer hovers around 5Mbps throughout. A slightly disappointing transfer. Audio Transfer Review: Paramount has done a nice job with the English DD5.1 audio track for this character-based drama. The majority of the audio track is center channel-based dialogue, but there is nice spatiality across the front soundstage and plenty of atmospheric, non-gimmicky surround usage. There isn't much need for LFE, except the rumbling of a train and one other event I choose not to spoil. Where this track shines is the immersiveness of the musical score, which enriches the dramatic aspect of the film nicely. A decent DS2.0 English track is also included, but it lacks the directionality and depth of the 5.1 track. Extras Review: Although Paramount offers a mere 16 chapter stops for this 01h:46m:12s film, and the obligatory theatrical trailer (in OAR) that pretends not to reveal too much of the story by clipping one second off an important bit of dialogue, they at least include a very nice, full-length commentary track with writer-director, Éva G á rdoz, and her longtime friend and producer-actor, Colleen Camp, who she met while working on Apocalypse Now. The two, recorded just after the World Trade Center attack, give a lot of behind-the-scenes information, including the trials and tribulations of reshooting because of an uncooperative baby (the two didn't seem to know about hiring twins! ), purchasing a painting from the set, re-editing the linear format of a scene, or the history behind a particular sequence, as well as some personal recollections by Gárdoz, relating to the story. The two friends never stop talking, and their obvious enjoyment of putting this very personal story to film shines through while still illustrating the difficulties of getting it there. The commentary earns the grade here. 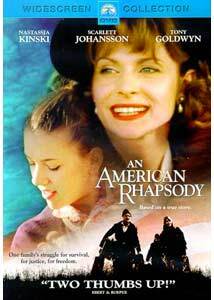 An American Rhapsody is so many things: a survival saga, a coming-of-age film, but mostly it is the exceptionally moving voyage of the heart that proves that neither time or distance can truly separate a mother and daughter. Break out the Kleenex. Highly recommended.